Chickadee™ ‘FL04-235’ | Florida Foundation Seed Producers, Inc. Description: Chickadee™ ‘FL04-235’ is a vigorous plant which has a good survival rate. It has a desirable upright growth habit, with a narrow base that makes it nearly monopodial. It also possesses stout twigs and stems with a loose berry clustering pattern. Production is advised south of Gainesville due to the plant’s tendency to uproot when bearing heavy ice loads. This plant flowers very early and has very high pollen abundance. Trials in Windsor, FL concluded a mean date in which half (50%) of the flowers opened to be January 28 (late January). Chickadee™ ‘FL04-235’ produces very high quality berries with a flavor that is sweet with a low acidity. The berries are large and firm, and almost crisp. Mean berry weights for trials in Windsor, FL were 2.36g (STDEV 0.21). Berries ripen extremely early; half (50%) of the berries were ripe by April 15 (mid-April) in trials in Windsor, FL. Berries maintain their high-quality for a very long time on the bush. 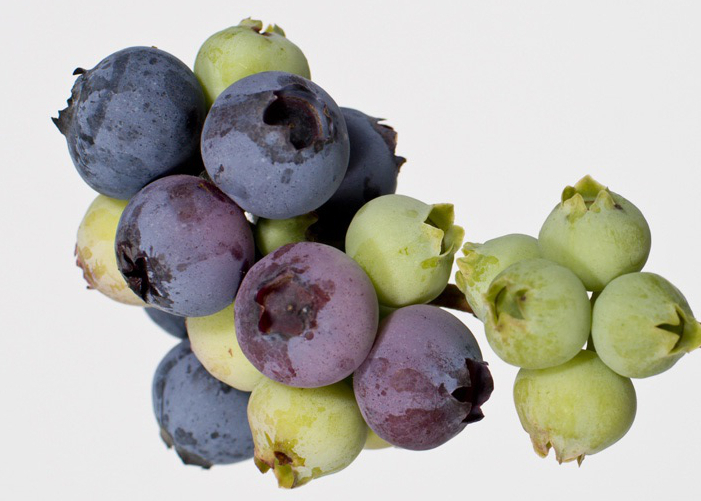 These berries detach with medium to medium-hard force.